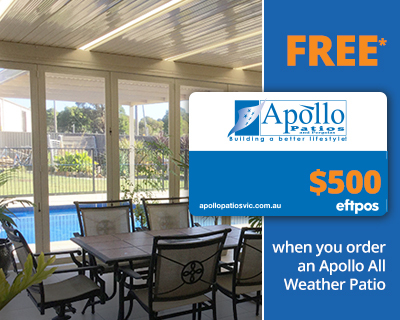 A patio from Apollo combines high quality, outstanding design possibilities and functional simplicity. It is designed specifically for your home and will not only add value to your property, but also turn unusable outdoor space into a versatile and functional area all year round for you to enjoy entertaining, barbecues, extra room for the family, or somewhere to relax. With a huge range of designs and finishes available, your Apollo outdoor home addition will be architecturally designed to work with the existing style of your home, whether you prefer gables, arches, or flat roof, we can create a design to suit you. Apollo’s unique building system creates a beautiful clean ceiling look, so you can’t see any structural elements such as support struts or beams which are built into it. Our unique Durasheen paint will keep you cool inside your patio or pergola, and its high-gloss finish ensures your space is bright and light. It also comes with a 15 year guarantee against fading, cracking, or chipping so you know your new addition will stay looking great.